First time wearing the vintage sequin top from my estate sale haul. It was perfect for a girl's night out with Girl Get A Life. We celebrated her birthday with tapas, cocktails, and reggae. Sequins were very necessary. The little black shorts took it next level. These shorts are shorter than my white shorts. I usually wear them in the colder months with tights. Surprisingly, I didn't feel naked wearing them with so much bare leg showing. The oversized volume of the sequin top helps balance things out. I rounded out the look with a great pair of snakeskin print sandals from JustFab.com*. There was a free pair code in my Lipstick and High Heels goodie bag. I've never hit the final sale button on any of the shoe club programs. I was concerned about the quality. Cheap heels on poor little baby toe, I cannot do. No ma'am. I was completely wrong though. These shoes really are Just Fab! The quality is pretty good. They're not hard and uncomfortable either. I didn't start to feel the pain until after I finished my two step at 2a. Even then, it wasn't and all out tears of pain baby toe killing experience. I will definitely check them out again! Sequins are delicate and can unravel easily. Examine thoroughly if purchasing in a thrift store where there's possibility of damage from all of the man handling. Sequins can be a little more costly in thrift and vintage stores. If you like it, it's usually worth the cost. Visit those estates sales! The condition is likely better having been in someone's closet. Ignore size labels and try on. The sequin top I'm wearing is size XL. Sequins can stand on their own and don't need a lot of accessories. Wear sequins with a sweater or blazer for a daytime look. Pair a sequin top with jeans or shorts for a casual yet fabulous evening look. 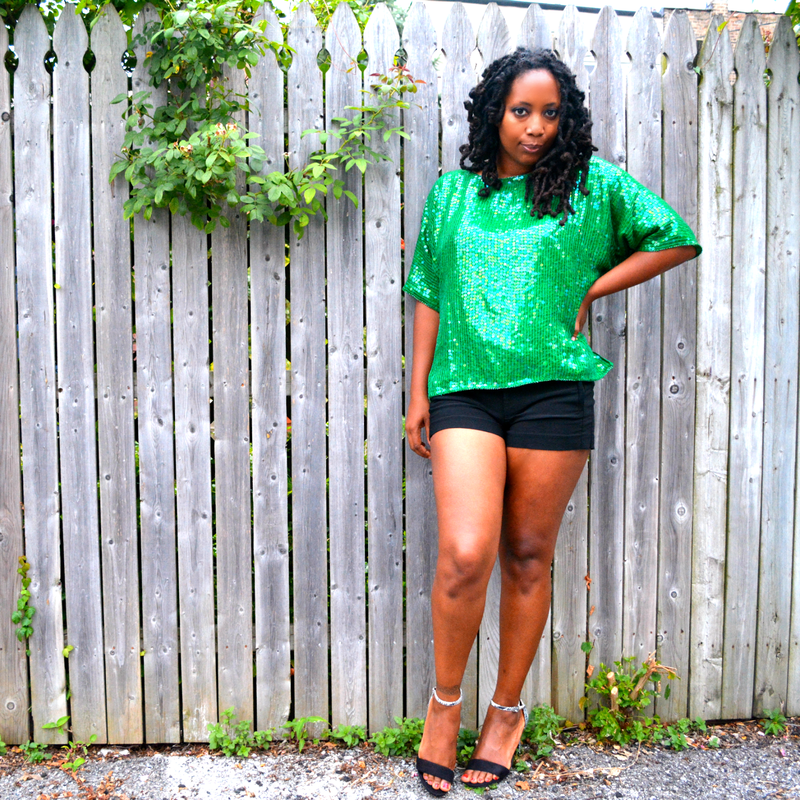 Dare to wear sequins with teeny tiny shorts? Expect attention. I have Stuart Weiztman pumps, Sam & Libby ballet flats, vintage Oleg Cassini shoes plus a pair of Joe's Jeans for sale. Visit my eBay and Etsy store for details. Great top! Love how you paired it with shorts. Love this outfit! 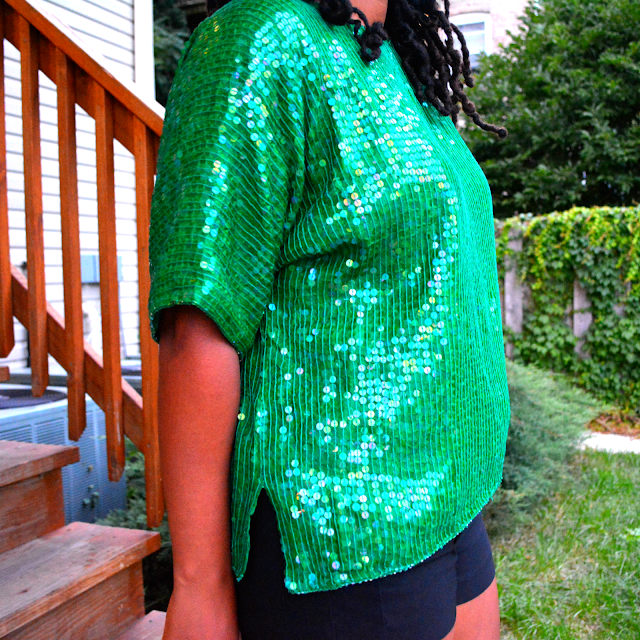 I just got a sequin top from the thrift store that i'm styling for later this week. This was a great inspiration! I love it! 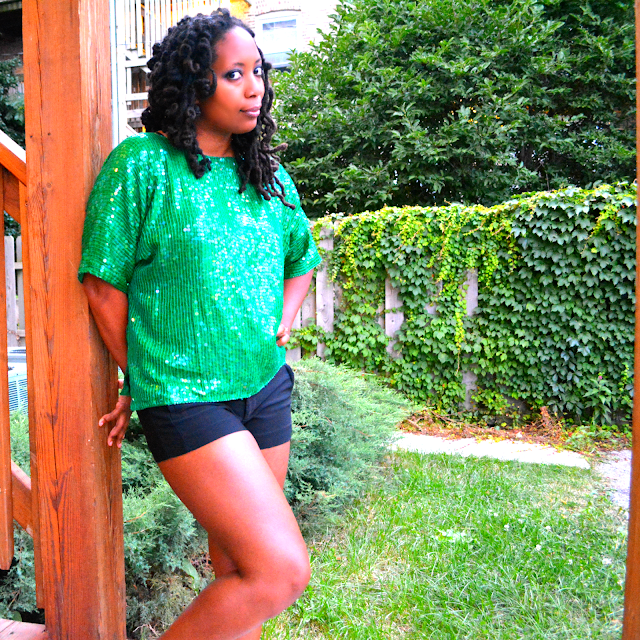 I am a sequins hoe....most of my daytime tops are embellished.I think this is perfect! It reminds me of something my friend Elise would wear. Too cute! Go 'head! You're giving me all types of Beyonce realness in these photos :). I LOVE this! The sequin top is beautiful! Such a chic look and the color is gorgeous! Love it! Diggin' that top! The color is fabulous! Beautiful outfit! 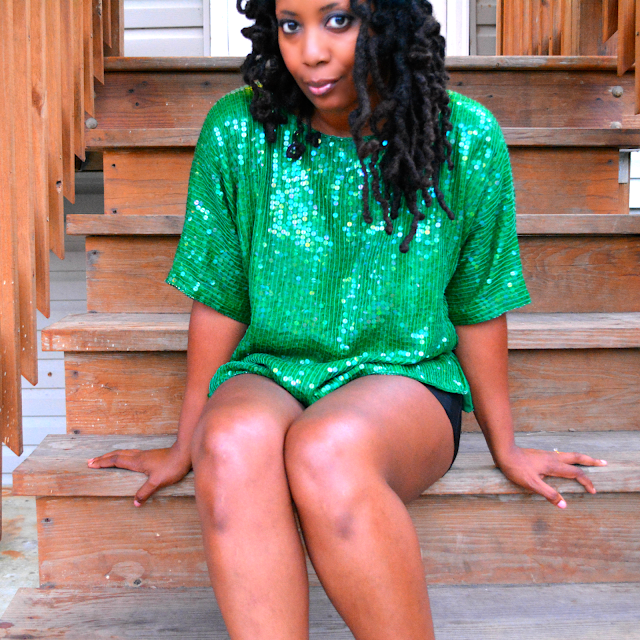 That gorgeous green sequin top is such a great find! Perfect! Love this! You look great! I had a designer sequin top from the 80s that I totally punked out on. Now, I wish I still had it. I still have a pair of sequin leggings that I love. Only thing is I have no idea how to wash them. Do you know? Ohhh! I want to see. Can't wait to see you style it! Thank you! I like to look like a walking party! Stick to whatever the label says. Trust me. I tried to freshen up some sequins and put them in the dryer in a lingerie bag. Big mistake. It's rare you find that kind of cut in a sequin top! I love it because it looks so gorgeous with your skin and hair and it's cut like a fancy t-shirt! Thanks for linking this up last week on the Verizon Voices Fashionista Style Hop. 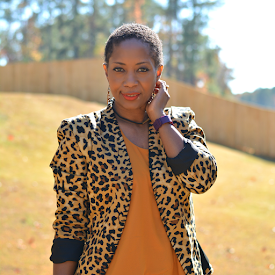 Head on over this week and link up here: http://www.modlychic.com/2013/08/verizon-voices-fashionista-style-hop-august-20.html We'd love have more of your style. And sign up for our weekly reminders too!